The Peak District is the UK’s oldest National Park and at Losehill House Hotel and Spa, you’re right in the heart of some of the best walking and outdoor activity in the country. Explore rolling hills and sweeping moorlands, from hilltops to deep valleys, dales and bridleways. Soak up the atmosphere of one of the Peak District’s wonderful towns, from the heritage of Buxton to the hidden caves of Castleton, or simply marvel at the view from Win or Lose Hill right here above the hotel. The Peak District also has some of Britain's finest Country Houses including, Chatsworth, Haddon, Lymm Park and Hardwick Hall to name a few. Overlooked by Mam Tor at the head of the valley, and towered over by the impressive Norman keep of Peveril Castle, the delightful village of Castleton is well worth a visit and packed with interesting attractions such as Treak Cliff and Peak Caverns, as well as a vibrant selection of shops, cafes and pubs. Originally a collection of Herdsmen's shelters, now hamlets known as Upper Booth, Barber Booth, Ollerbrook Booth and Nether Booth. 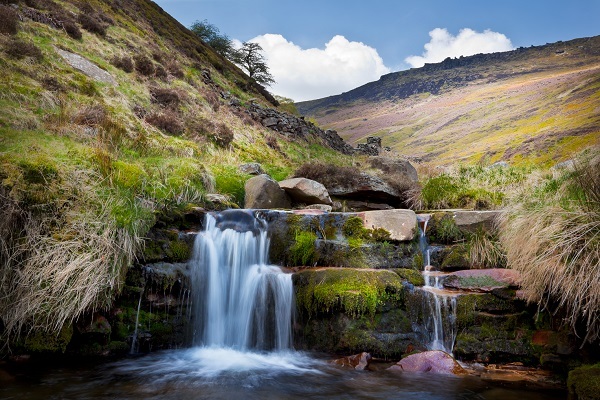 The most central of them, Grindsbrook Booth is otherwise known as Edale Village, and situated at the foot of Kinder Scout Edale Village is also the start of the Pennine Way. World-famous for its spa water, Buxton is situated just over a thousand feet up in the Derbyshire hills and is home to the Buxton Opera House, Pooles Cavern, Pavilion Gardens as well as a wealth of independent shops and a thriving arts scene. Click here to see Buxton Lifestyle Magazine. The house, garden, farmyard and adventure playground, shops and restaurants are open everyday until 23 December. The 1000 acre park, the farm shop and its restaurant are also open all year round. A lovely 6 mile walk taking in the magnificent scenery of the Hope Valley, courtesy of Discover Derbyshire. High Peak Challenges offers a range of bespoke adventure activities to corporate clients, individuals, groups and families in the Peak District National Park. Experienced and friendly staff instruct: guided walking, mountain biking, fell running, climbing and much more. Call 07970891778 for more information. The reserve consists of five separate limestone valleys - Lathkill, Cressbrook, Monk's, Long and Hay. These five dales represent some of the best examples of wildlife and geology in the White Peak. Site of the Dambusters practice. Click here for more information. The Hope valley is one of the most attractive areas of the Peaks and contains an unrivalled mixture of scenery, with limestone crags and dales on one side and the shale hills of Mam Tor, Lose Hill and Win Hill on the other. The imposing ruins of Peveril Castle stand high above the pretty village of Castleton in the heart of Derbyshire’s Peak District. Mentioned in the Domesday survey, Peveril Castle is one of England’s earliest Norman fortresses. Now managed by English Heritage. Take a boat trip 450m under the Hills of Castleton to the Bottomless Pit and see Peak Cavern's historic Rope-Making works on a fully guided tour of the cave. A world famous series of caverns considered to be the finest range in Great Britain. Located at the beginning (or the end!) of the Pennines, the High Peak Estate is an upland property typified by dramatic scenery. Open and unrestricted access for walkers all year to moorland.